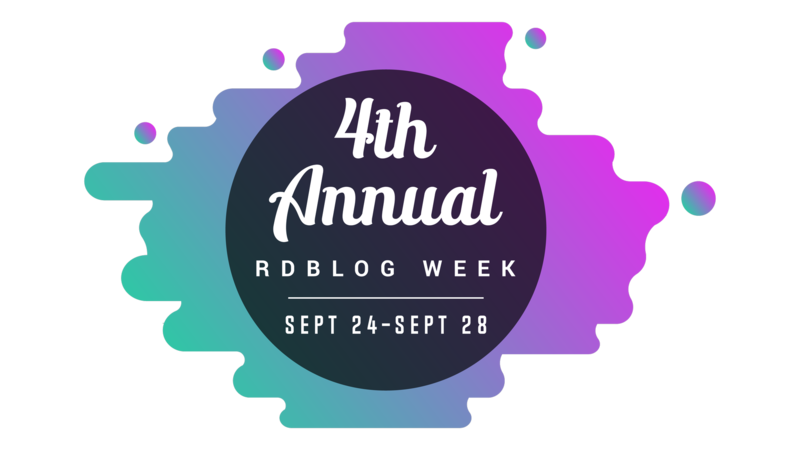 Okay, so… I have RA but it doesn’t have me. As long as I can keep going, I’m darn sure going to keep going. And to that end, as long as my fingers hold out I’m going to crochet. I “do” four granny squares a month to exchange with other crocheters. It’s fun and in another few months, I should have enough to start piecing together the jackets that I want to make so they might be just in time for spring. So… when I saw that Darn Good Yarn had a subscription service I thought long and hard and the next day subscribed. I’ve worked some with bags. I’ve worked some with old sheets. I’ve worked with t-shirts. 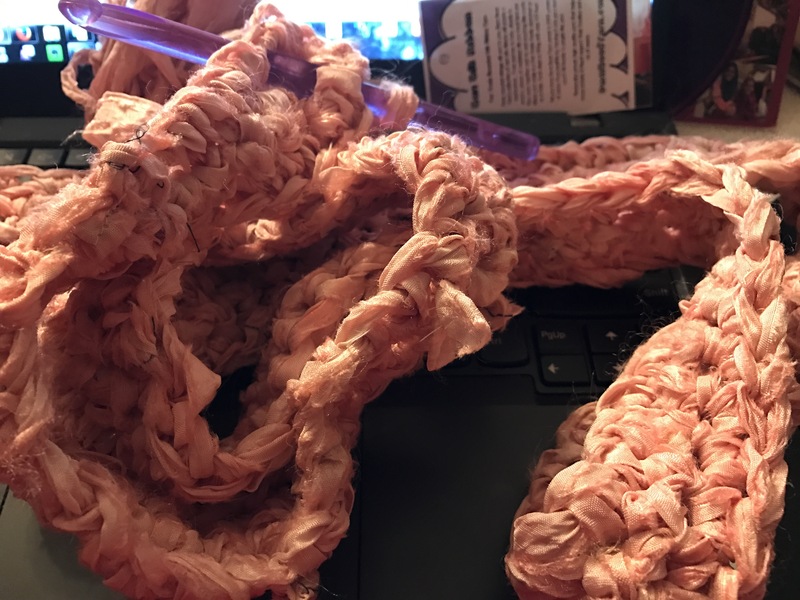 If you make long strips of material, they work like somewhat bulky yarn. And they contain so many memories at the same time. It is interesting in my head at the same time that it is less painful in my hands. Yesterday, my fist ‘shipment’ came in the mail. It was dusty pink. The ‘yarn’ is made from discarded saris. This creates a job market for highly impoverished women of India and Napal so they can become independent. 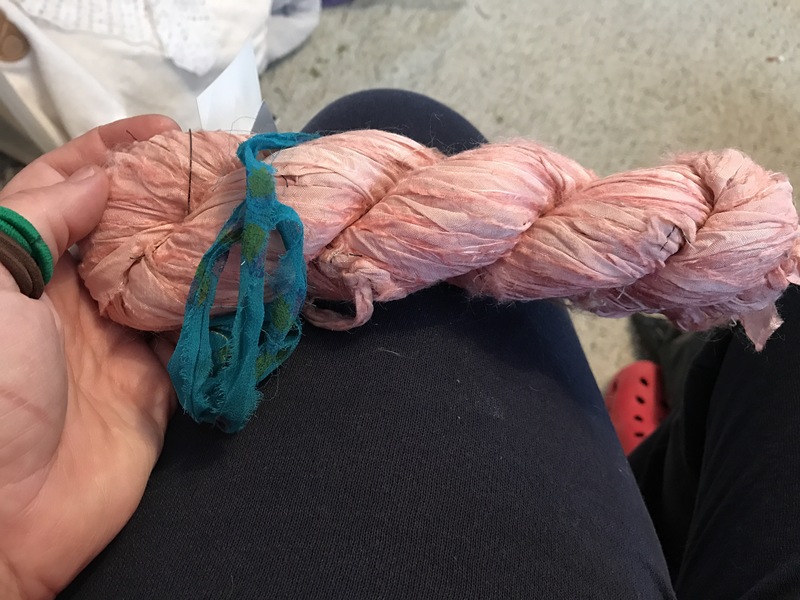 they shred old saris and ball them up into silk ribbon yarn and Darn Good Yarn (and I’m guessing some other companies) sell them. It is Fair Trade Recycled Silk Ribbon Yarn, and it is amazing. Granted, it works up differently than ‘normal’ yarn because it doesn’t give but it also is awesome because it DOESN’T give which means it is way better than yarn for different projects. I have already worked through my first shipment and am anxiously awaiting my next shipment… I think the project I have undertaken will take considerably longer than I thought it would, because 100 grams doesn’t go nearly as far as I was hoping it would, but I’m thinking that maybe I’m going to have to add a few extra shipments, or up my subscription, when I have a little extra bits of disposable income, to get my project done. It the mean time, I’m having so much fun with this. 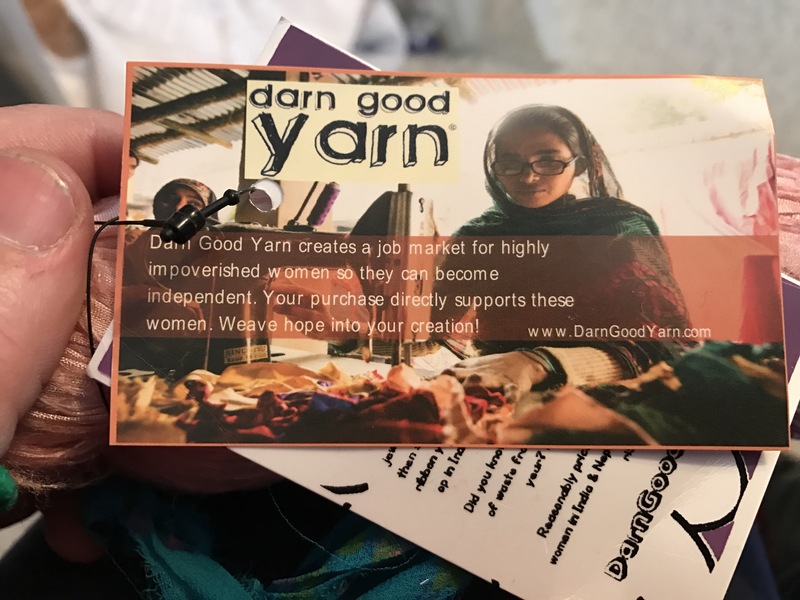 It might be a little more pricey than yarn yarn, but I like the idea of fair trade and it’s awesome to be trying to figure out what stories lie within the yarn that comes in the mail, and the lives that are being touched a half a world away. 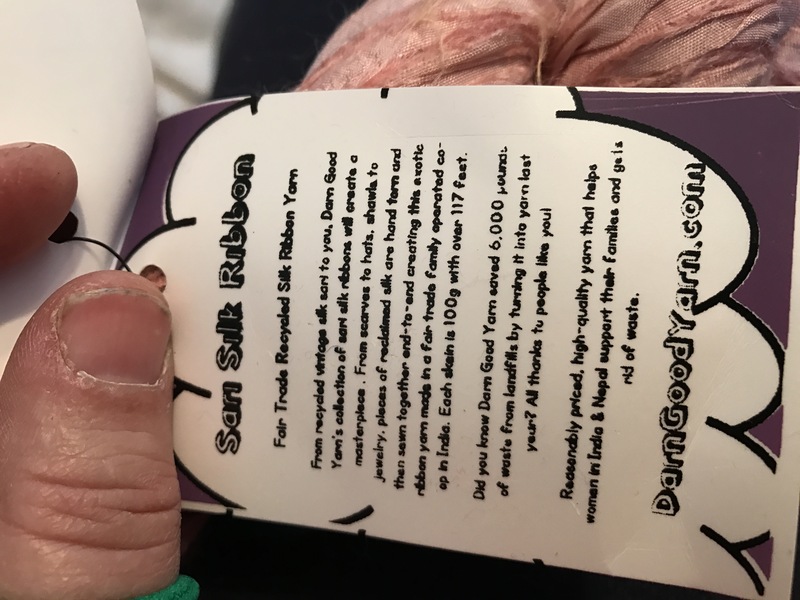 This entry was posted in rambling and tagged crocheting, darn good yarn, DarnGoodYarn, fair trade yarn, silk ribbon yarn. Bookmark the permalink. I know nothing about yarn (except a good story and I have several of those yarns) but it looks so cool. What an awesome idea! I hardly have time to crochet, even my quilting has gone by the wayside while I was deep into copyediting classes. I figure keep the old noodle at work and keep senility at bay forevermore. But this sounds like a wonderful project.